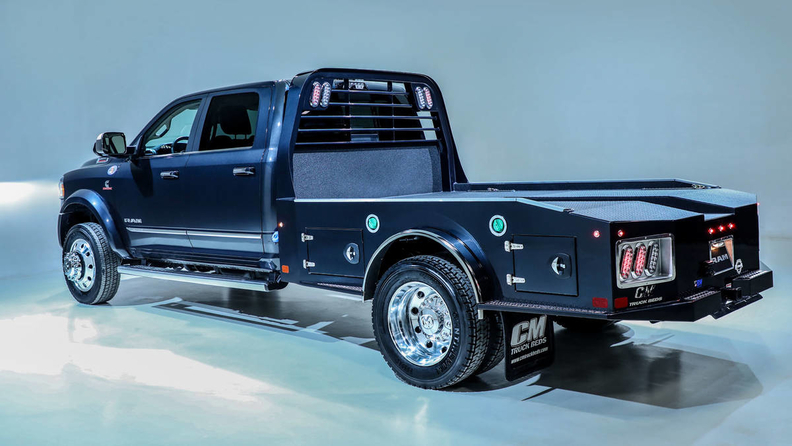 The retooled 2019 Ram Chassis Cabs are equipped with either a 6.4-liter Hemi V-8 engine or a Cummins turbodiesel engine. The Chicago Auto Show is always a little truck-heavy, and for 2019, it’s the retooled Ram Chassis Cab that’s one of the first off the block. The 3500, 4500, 5500 grades will come with a segment-leading towing capacity of 35,220 pounds and a payload of 12,510 pounds, Fiat Chrysler Automobiles says. An updated Cummins diesel I-6 now produces 800 pound-feet of torque; that’s also the most in Class 4 and 5 trucks. With 97 percent high-strength steel frames, the new Chassis Cab pickups are up to 120 pounds lighter than outgoing models. The 6.7-liter diesel isn’t the only engine option. The standard powertrain in the 2019 Chassis Cabs is a 6.4-liter Hemi V-8, with cylinder deactivation, that produces 410 hp and 429 pound-feet. It is paired with either a standard TorqueFlite eight-speed automatic transmission or an optional Aisin six-speed automatic transmission with Power Take-Off. The six-speed uses a new transmission controller, according to Ram, for faster, more precise shifts under all conditions. The four-wheel disc brakes also get an upgrade for better pedal feel and shorter stopping distances. The Ram Chassis Cabs come in four industry-standard lengths and feature a flat mounting surface in the back for upfit and accessory installations. It also features new powertrain mounts and C-pillar body hydromounts to help reduce noise and vibration and improve ride quality. Active safety systems include adaptive cruise control, forward collision warning, automatic emergency braking and AEB with trailer brakes -- available on all trim levels. The trucks also are equipped with parking sensors, a 270-degree camera, trailer reverse guidelines and a cargo-view camera. The trim lines available mainly follow the regular Ram pickups. It starts with Tradesman, SLT, Laramie and Limited. There’s also a new instrument panel and FCA’s new 12-inch Uconnect touchscreen with specific functions for the big trucks. It offers a choice of four audio systems, including a top-of-the-line, 750-watt Harman Kardon system. A new bank of buttons and switches control accessories while the new HVAC system features 30 percent more airflow at lower noise levels, according to Ram. Other creature comforts include wireless charging for cellphones, more cabin storage space, five USB ports and two available 115-volt outlets. The 2019 Ram Chassis Cab goes on sale in the second quarter of this year. Pricing will be announced later, but the current 3500 Tradesman starts at about $35,000 and 5500 grades begin at $40,000.